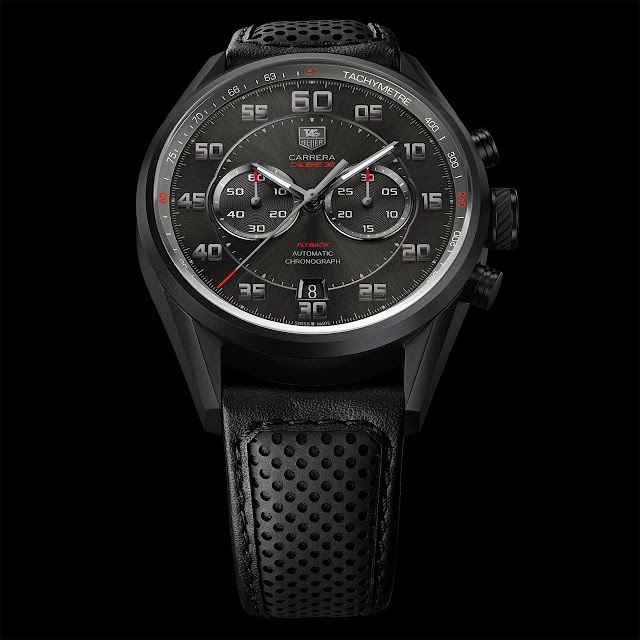 Tag Heuer adds to its Carrera collection with a stylish sports watch driven by the proprietary Calibre 36, thus named for its 36,000 vib/hour frequency. This elegant chronograph has the distinction of a flyback function, a complication inspired by car racing but of equal use to pilots, for instantaneously resetting and restarting the chrono hand. The generous 43 mm case, made from grade 2 titanium, stands out for its black carbide coating and sanded finish. The anthracite dial boasts the signature sunbrushed finish while the hour-markers and different hands are in black gold. The snailing on the 30-minute counter and small seconds testifies to the importance TAG Heuer affords to detail. The perforated black strap takes its cue from racing-car steering wheels, an environment that runs through the design and values of this new timepiece from TAG.